Always check that you are centered on the camera, and make sure your dishes are done before the call. Don’t get me wrong: there is still the need for secure, reliable, robust video conference systems like Polycom, Lifesize, Cisco, and Tandberg (or Cisberg). These server-based solutions will always have their place in government, law, financial institutions, executive boardrooms, or when hundreds of employees need to attend the same video conference meeting. But many smaller companies just can’t afford to invest in a $25,000 video conference cart or $250,000 Telepresence Suite, so the option of paying a low monthly fee for multi-point video conference calls is very appealing. All HD cameras are not created equal – There is a reason that the typical video conference camera costs about $3000, and your USB camera costs $50, and its not just the Pan-Tilt-Zoom control. Consumer video cameras (like the one built into your laptop) were made with the cheapest components available, including the lenses. If two cameras are listed as HD 1080p resolution, it does not mean they will produce the same high quality video. To improve your camera’s video quality: sit closer, close the blinds, and turn on all the lights in the room except those directly behind you. If that doesn’t help, consider buying special video conference lighting fixtures for your computer. Please, Santa? Your microphone was not designed for panel discussions – Most conference rooms have long oval tables. Some conference rooms have flexible furniture with six or eight foot tables arranged in O, U, or V shaped configurations. If you are going to attempt to use Skype, Google Talk, or GotoMeeting in a larger conference room like this, you should consider a tabletop microphone system specifically designed for larger groups. These come in single units, or multiple pods that can be linked together. Some models plug directly into a phone’s headset jack, but if you are going to send the audio through the computer, be sure to get a USB enabled speakerphone. Smaller round tables can benefit from the wireless Revolabs Solo USB. It may be acceptable if a few people are not captured on video, as long as everyone can hear clearly, and be heard. 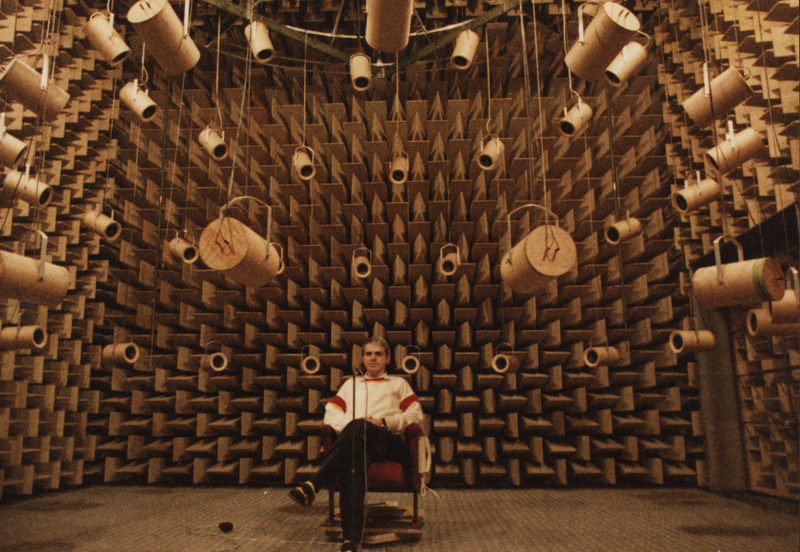 Your conference room is not an anechoic chamber. The ceiling tiles in your conference room were probably chosen based on their looks or their cost, NOT their acoustic absorption properties. Any microphone in a poor acoustic environment will pick up the bad reflections and reverberations, which makes the conversation more taxing because its tougher to understand. Next time you use a speakerphone in your conference room, ask the far end call participants to rate the audio quality on a scale of 1 to 10. If they say anything less than 9, you should seriously consider upgrading the acoustics in your conference room by adding fabric wrapped fiberglass panels and/or higher quality ceiling tiles. Also, be sure to close the windows and doors before you start any phone call or video conference, as it will greatly reduce the background noise. Just because it worked this week, does not mean it will work next week. You may have the best Skype video conference call on a given Friday, and then be surprised the following week when you experience poor audio and video quality. The reason is because of bandwidth limitations, network traffic (on either end), and something called Quality of Service (QoS), which is outside of the scope of this article. There are also special video conference border proxies that will help remote users traverse firewalls and make the systems more reliable. Are we addicted to multi touch? 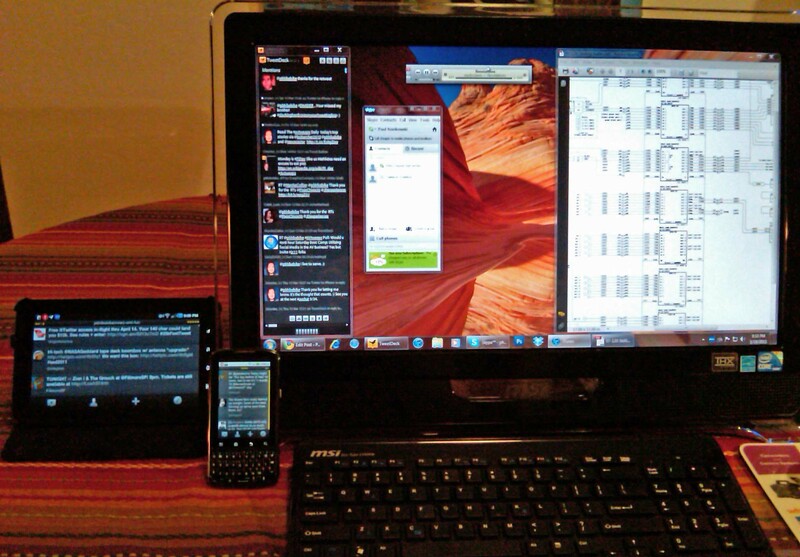 I think I’m addicted to multi touch screens. Seriously, in the past six months, I’ve purchased a 7″ Samsung Galaxy Tab (which is like a Droid IPad), an MSI All-in-one PC with 22″ touchscreen, and a Motorola Droid Pro mobile phone with 3″ multi touch screen and “hard key” QWERTY keyboard. Each device is perfect for different scenarios. 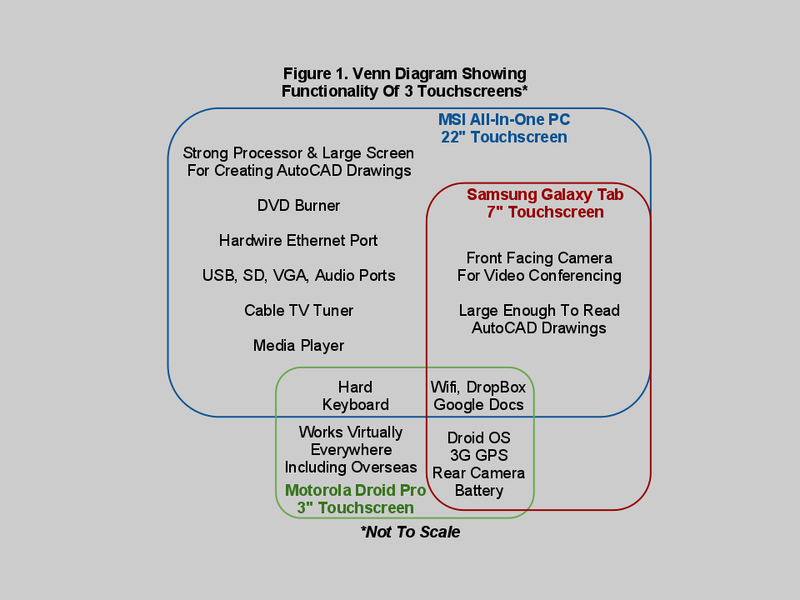 Looking at the diagram, it looks like I could ditch the tablet. But like any IPad user, there is no way I’m going to give up my tablet, because it is perfect for meetings. Take the typical 1 or 2 hour site meeting. Before the tablet, I would lug my laptop to every meeting, in case I needed access to my local files. I would check email on my Blackberry, and it wasn’t easy to read PDFs or show them to other people. If I wanted to use the laptop, I needed to boot it up, ask my client for a wifi password, an/or hardwire LAN connection. I need to bring my power cord and find a power outlet unless I had a good battery. Sometimes I would bring a mouse and mousepad, plus the project drawings and folder of documents. It was a backpack full. Nowadays, when to go to a meeting or site survey, I usually only bring the Samsung tablet and a paper notepad. I leave the Droid Pro in the car, and the PC at the office. No laptop, period. During breaks, I can easily check important emails, and visual voice mail. I have full access to my cloud stored files, including local versions, so I don’t have to bring a binder or job folder. I can reference any cutsheet or instruction manual, or video call into video conference rooms. My particular tablet is also great for taking site survey photos. I still prefer taking meeting notes with a pen and pad. For whatever reason, taking notes on paper seems to be less rude than taking notes on a laptop or tablet; the latter almost seems like you are only half-listening. Call me old-fashioned.